Wallowa County Farmers' Market: Planting Festival Kicks off Farmers’ Market Season! Planting Festival Kicks off Farmers’ Market Season! 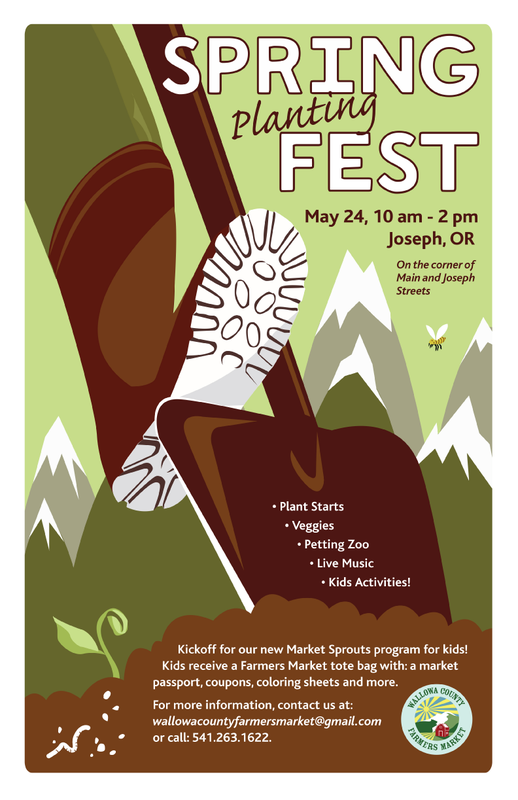 Plants and fresh vegetables, live music and kids activities, including a petting zoo, will be featured as the Wallowa County Farmers’ Market launches the 2014 season Saturday, May 24, with its traditional Spring Planting Festival in downtown Joseph! Vendors will be selling vegetable and ornamental plants, local produce, baked goods and crafts. Enjoy live music by Janis Carper as you check out the market wares. The market opens at 10am and runs until 2pm at Main and Joseph streets. The Spring Planting Festival also kicks of a new kids program at the market – Market Sprouts. The program is for kids 3-12 years old to learn about eating fresh, local food and have fun at the farmers’ market. At the kickoff event, kids will receive a farmers’ market tote bag and a Market Sprouts passport to fill throughout the market season. Kids will also receive coloring sheets, a plant start and coupons to try new foods and other items from market vendors. Sprouts activities will take place at Joseph and Enterprise markets from now through October. The Wallowa County Farmers’ Market is proud to introduce Kimi Starner as its new market manager. Kimi was born and raised in Wallowa County and is excited to share her passion for local, fresh foods. Kimi and her five girls raise a variety of animals on their small farm, Whispering Willow Farm. They raise sheep, both dairy and meat goats, alpacas, rabbits, and chickens. In addition to her and her children being very active in 4-H and FFA, they sell goat products, sheep and alpaca fiber, and eggs from their farm. She has experience planning many 4-H and farm activities and looks forward to working with the board to plan this year's fun season.